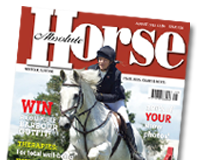 HorseQuest, the UK¹s leading independent equine sales website, is delighted once again to be supporting the Mitsubishi Motors Badminton Horse Trials, taking place from the 2nd to the 6th May 2013, in Gloucestershire. Following previous success HorseQuest will once more sponsor the legendary Quarry Fence. To celebrate their continued support of this prestigious three-day event, HorseQuest will be giving visitors to their stand (number 259) the chance to win a range of great prizes in their Badminton free prize draw. In addition, anyone placing an advertisement when visiting the trade stand will receive a 10% discount and have it displayed on the stand during the event ­ which attracts over 150,000 visitors, making it the perfect place to advertise! Launched today, the ‘Rehome a Horse Month’ takes place throughout April across the country and gives the public a chance to offer horses a loving home and make space for the ones in desperate need of help. Coronation Street actress Kate Ford, who plays ‘villain’ Tracy Barlow in the popular soap, will be visiting Norfolk in April to officially open the brand new Redwings Visitor Centre at Aylsham. The award-winning actress has a strong connection to Redwings, aside from her own love of horses. Kate’s own pony Roxy was retired to Redwings Horse Sanctuary in 2004; the actress has always been a big fan of the charity’s work and has kept in contact with the team, even after Roxy sadly passed away. She has agreed to be part of a special Fun Day at Aylsham on Saturday 27th April to help celebrate the new visitor centre’s opening. Entry is free. 6th April saw the launch of British Carriagedriving – formerly the British Horse Driving Trials Association – with a bright, new, stream-lined modern logo and user-friendly website. The new name and its abbreviation, BC, will bring the discipline in line with other Team GB equestrian sports; British Dressage (BD), British Eventing (BE), British Showjumping (BS) and British Reining (BR). Essex-based family-run horsebox hire company, NAGS On The Move, have been delighted with the response to their competition run in conjunction with Absolute Horse Magazine and popular equestrian photographer, Neil Fortescue, to find the ‘Face’ for their advertising and online marketing campaigns. Identical twin equine vets, Wendy and Alison Talbot, are preparing to put their best feet forward for this year’s London Marathon, having endured a gruelling training schedule, beset with injuries. Wendy, a National Equine Manager for Zoetis UK Ltd, suffered a suspected cervical fracture last year. When she was given the all-clear she pledged to raise funds for Spinal Injuries Association by running the London Marathon. Twin sister Alison, a Clinical Teacher in Equine Orthopaedics at University of Liverpool, vowed to join her, every step of the way. The twins have motivated each other to carry on despite incurring injuries between them, including a tibial stress fracture, achilles tendonitis and pulled muscles. Working together, Nissan and The British Horse Society will offer supporters the opportunity to learn more about safer horse towing and how best to look after horses during transportation through a range of activities and events. The new relationship will also provide the equestrian charity’s supporters with offers and savings of up to 15% across Nissan’s X-Trail, Pathfinder and Navara vehicles. Each vehicle offers BHS supporters a powerful and frugal diesel engine and excellent towing capacities with impressive on-road and off-road capabilities to match. Together with British Riding Clubs, the BHS has more than 100,000 supporters with many having a genuine need for a reliable 4×4 vehicle that can provide a safe horsebox towing experience. BHS supporters wanting further information or to take advantage of discount offers should contact Ames Nissan. Redwings Horse Sanctuary – which still has 63 horses, ponies and donkeys in its care from the infamous Amersham rescue in January 2008 – was recently part of another rescue involving dead and ‘queuing to die’ horses from Caerphilly in Wales. There will be two short, educational talks, one from Equine Nutritionist, Lizzie Drury, MSc RNutr, and one from Alex Buist, BVSc MRCVS of Ryder-Davies & Partners Veterinary Surgeons. Philip Spivey, International Show Jumper will then provide a demo focusing on exercises to improve show jumping fitness and performance. There are a limited number of free tickets and must be reserved through Saracen Horse Feeds via their facebook page, email or by calling 01622 718487. Spaces are limited so reserve your space as soon as possible.